For those who think like my friend – I'm sorry, but your way of losing weight, which as you see «meaning» (eat a little, burn a lot of fat, create a calorie deficit), will lose any sense, if you pay attention to all biological factors. And I've seen this more than once! Sigh. Life is not easy. 1. Why do I have to eat more often to lose weight? Explain – your body wants to burn fat, when it's in the fasted state. And the hunger comes after about 4 (someone like) hours after a meal. Your body has plenty of its own priorities, such as survival, immune system, reproduction capabilities (endurance),increase muscle mass, burning fat and maintaining harmony etc... And from this list, survival is the highest priority among them all. Guess what the priority is in last place? Muscle building and fat burning. So you see, while you assure your body that it survives and is absolutely free from all sorts of illnesses, it will not even have to care about building muscle or burning fat at all. Now think about what a body can survive, while long time without food? Response – the body with a large number of pending and stored calories (fat) and slow metabolism (no muscle mass). And that's what we hate! So how does this all tie in with the frequent eating? If we eat often, our body will not be so concerned about its survival, because he knows that you deliver him food every few hours.Thus,the body will not accumulate fat feverishly to save your muscles to survive.Taper to burn fat will be much easier. That's why there's one or two times a day is the worst thing you can do when trying to lose weight. 2. Why should I do strength training if I want to lose WEIGHT and not build muscle! Appeal to those who like cardio and otherwise avoiding strength training – how was your day? Forgive me for what I am about to say, but I have to do this! 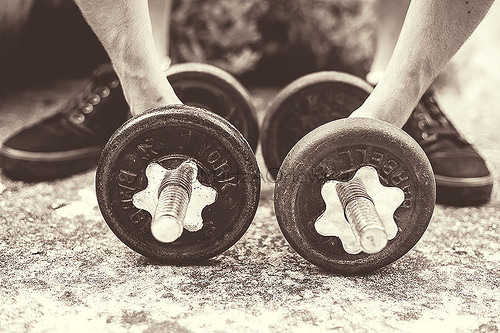 – your results could be much more effective if added to your workout strength exercises! You see, strength training for a short time increase your lean muscle mass and improve metabolism, which promotes rapid and safe weight loss. In addition, it will give you, girls, healthy but not skinny look. For guys it is, incidentally, also applies. And once again appeal to girls — don't think you will be «rolling», doing strength training. Do not forget that your level of testosterone just won't let you do that. Basics to Losing Weight, Lose Weight Surgery, Lose Weight Pills for Women. How To Lose Weight FAST for Summer! !